A team of scientists has discovered that the drastic decline in Arctic musk ox populations that began roughly 12,000 years ago was due to a warming climate rather than to human hunting. "This is the first study to use ancient musk ox DNA collected from across the animal's former geographic range to test for human impacts on musk ox populations," said Beth Shapiro, the Shaffer Career Development assistant professor of biology at Penn State University and one of the team's leaders. "We found that, although human and musk ox populations overlapped in many regions across the globe, humans probably were not responsible for the decline and eventual extinction of musk oxen across much of their former range." The team's findings will be published in the early on-line edition of the journal Proceedings of the National Academy of Sciences during the week ending Friday 12 March. 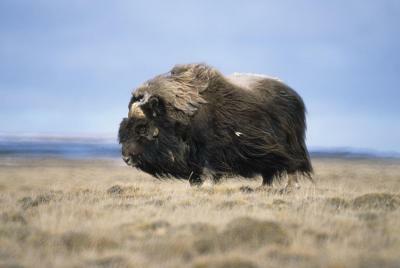 Musk oxen once were plentiful across the entire Northern Hemisphere, but they now exist almost solely in Greenland and number only about 80,000 to 125,000. According to the researchers, musk oxen are not the only animals to suffer during the late Pleistocene Epoch. "The late Pleistocene was marked by rapid environmental change as well as the beginning of the spread of humans across the Northern Hemisphere," said Shapiro. "During that time several animals became extinct, including mammoths and woolly rhinoceroses, while others, including horses, caribou, and bison, survived into the present. The reasons for these drastically different survival patterns have been debated widely, with some scientists claiming that the extinctions were due largely to human hunting. Musk oxen provide a unique opportunity to study this question because they suffered from a decline in their population that coincided with the Pleistocene extinctions, yet they still exist today, which allows us to compare the genetic diversity of today's individuals with those individuals that lived up to 60,000 years ago." To conduct their research, the team collected musk ox bones and other remains from animals that lived during different times -- up to 60,000 years ago -- and from animals that lived across the species' former range. From these remains, the scientists isolated and analyzed the mitochondrial DNA, which is useful for studying ancient population dynamics due to its rapid rate of evolutionary change. The scientists also isolated and analyzed the mitochondrial DNA of musk oxen that are alive today. They then used a Bayesian statistical approach to estimate how the amount of genetic diversity of the musk oxen populations changed through time. "Over the past decade, ancient DNA studies have matured, moving away from simply identifying animals to actually giving us insights into the population size and dynamics of animals, stretching back over the last 100,000 years," said Tom Gilbert, an associate professor at the University of Copenhagen in Denmark and another of the team's leaders. "Thanks to significant computational developments made by colleagues of ours, we have the fantastic opportunity to watch what happened to the ancient populations. When did they increase, or decrease, and at what rate?" he said. Scientists believe that a reduction in genetic diversity of an animal's population can reflect a decrease in the size of the population. By estimating when the genetic diversity of musk oxen began to decline, the team was able to test whether the decline was due to the arrival of humans in a particular region or to some other effect. 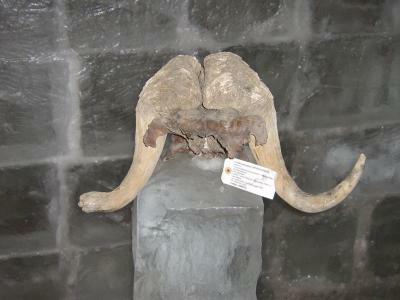 The scientists found that the genetic diversity of the musk ox was much higher during the Pleistocene than it is today. They also found that the genetic diversity of the species increased and decreased frequently over the past 65,000 years. "The periods of growth and decline observed in the musk ox populations in this study are considerably different from those that have been reconstructed previously for musk oxen or for other species, such as bison and mammoths," said Shapiro. "While musk oxen experienced a significant population decline nearly 65,000 years ago, mammoths first began to decline only around 48,000 years ago. Bison populations remained stable until around 35,000 years ago -- a period during which musk ox populations actually were growing. As we get a better idea of the overall picture of megafaunal dynamics in the Arctic, it is becoming clear that each species is following its own population trajectory. This is a strong argument that it is changes in habitat that are driving these population dynamics, and not a single factor such as the introduction of human hunters." Shapiro continued, "We know from historical data that musk oxen are sensitive to changes in the Arctic environment. While we cannot confirm exactly what climate factors are driving the changes we observe in musk oxen over the last 65,000 years, we can say with confidence that humans are not causing local extinctions. In Greenland, for example, humans and musk oxen arrived and began their expansion at the same time." According to Gilbert, "We wonder how the current climatic instability will effect the survival of musk oxen in the near future. There's a lot in the news about the plight of polar bears, but musk ox may be similarly at risk."